I was driving down a poorly lit road around 8:40pm, it was already dark. I had another person with me at the time. At first I didn’t really pay much attention to the craft as I assumed it was an airplane in a distance. I started taking more notice as I continued driving as the air craft seemed to be quite low and what seemed to be slow moving. However, as I neared the air craft it was not moving at all it was hovering in one spot directly over the road. It was hovering in one spot probably above the power lines. I kept driving but I slowed down as I was driving under it. I told my companion “that is no plane”! 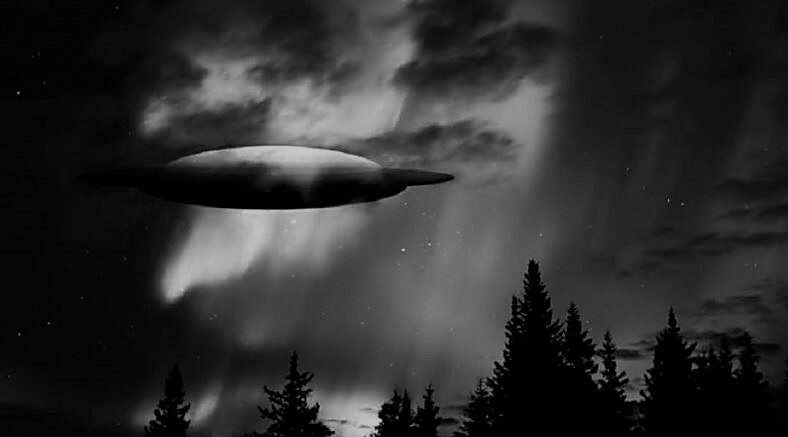 It was a black colour with lights, lights flashing like an airplane as that was the deception in the start. It was loud sounding as I passed under it. It was a long-ish kind of shape in width that was about the same size as the width of the road, double lane road. It had some kind of strips of material fluttering off it. It was not a drone. I drove under it but to be honest I was tripping out a little bit in the moment as normally I am a very skeptical person. I drove up to the next street crossing (approx city block and a half) and did a U turn as I was going to take pictures or a video etc. I sped back down the road but as I neared it again it left. It just seemed to look like just any other light in the sky within seconds. I don’t know for sure what it was. When I was under it was really the only time I could hear it’s engine. I couldn’t hear what it sounded like when it took off as I was speeding back toward it to take some pics. All that I could really hear was my own engine speeding back towards it. I don’t know what it was, but it was not a drone or an airplane. NOTE: The above image is CGI.